This couldn't be easier, basically it takes as long as potatoes take to boil! 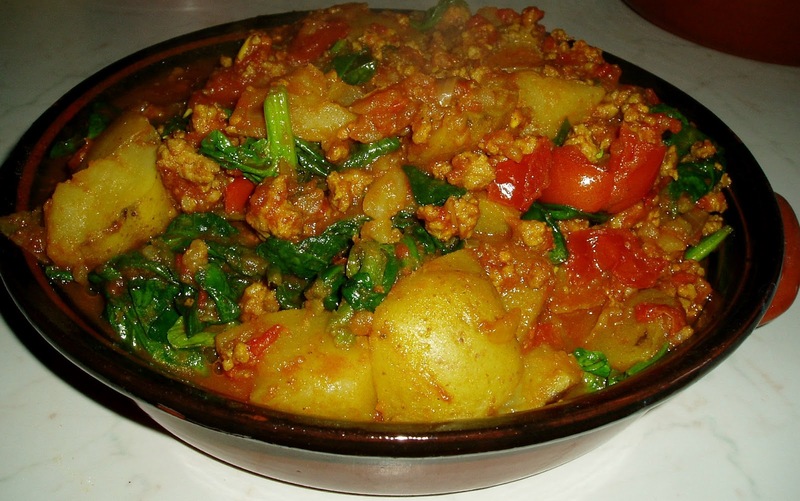 I love this recipe especially when I am too tired to"cook" I love it with minced lamb but I can't get that here, so far, so I use pork mince. This no nonsense, meal in a pot, quick to the table meal couldn't be easier! Extra lean Minced Pork or; fry the fat off & rinse the mince with hot water & wipe the pan before placing the mince back in. Put the potatoes on to cook. Spray a deep pan with cooking oil (low cal) & brown off the mince then drain, rinse & return to heat. Add garlic, onions & cook till softened.Add Ginger & curry powder & cook aprox 6 mins.Add the tomatoes & stock, bring to the boil, reduce the heat & simmer for a few mins. 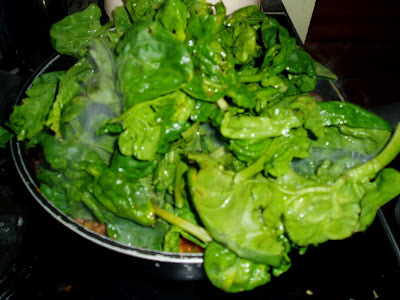 Add the cooked potatoes & spinach, cover & wilt the spinach. Easy as that!